Summary: For years, rumors of the “Marsh Girl” have haunted Barkley Cove, a quiet town on the North Carolina coast. So in late 1969, when handsome Chase Andrews is found dead, the locals immediately suspect Kya Clark, the so-called Marsh Girl. But Kya is not what they say. Sensitive and intelligent, she has survived for years alone in the marsh that she calls home, finding friends in the gulls and lessons in the sand. Then the time comes when she yearns to be touched and loved. When two young men from town become intrigued by her wild beauty, Kya opens herself to a new life–until the unthinkable happens. I honestly don't know if I can thing of a book with more buzz surrounding it then WHERE THE CRAWDADS SING by Delia Owens. I've been dying to read it for months, especially after Reese Witherspoon picked it as a Hello Sunshine Book Club Pick. It's only because I'm reading at a snail's pace lately that it's taken me so long to finally pick up this book... but I will say it was worth the wait! Unless you've been living under a rock, you probably have heard at least a little bit about WHERE THE CRAWDADS SING. This novel tells the story of Kya Clark, aka the "Marsh Girl." Kya's mother and siblings all left when she was a young girl, and soon thereafter her father disappeared too. Basically, Kya lived in the marshes along the North Carolina Coast and had to fend for herself, and she desperately craved human contact. Kya was fortunate enough to have friends in the local store owner and his wife, but for the most part she was all alone... until she meets a teenage boy who teaches her to read. He not only opens her world to books, but he also opens her heart to love. That is, until he goes away to college and doesn't come back to visit. It's Kya's broken heart that leads her to Chase, a wealthy and popular town boy; and she begins a relationship with him that will forever affect her life. I really want to tell you more about Kya's story, but I think it's best for me to leave it there and for you to pick up the book and find out for yourself. Suffice it to say that as sad as Kya's childhood story is, her adult one isn't any better. In fact, Kya finds herself accused of murder; and her reputation as the "Marsh Girl" and her unconventional life makes her an enigma to the townspeople. I truly treasured this novel. It's a well written coming-of-age story (and you know how I love coming-of-age tales!) about an amazing young woman. It's both touching and hopeful, and I so appreciated Kya's story. I found myself constantly rooting for Kya -- at first for survival, and then for the chance for love and happiness, and then again for survival. I was seriously impressed with Ms. Owens' and her storytelling abilities. It goes without saying that Kya's story is a special one, but I absolutely loved how the author chose to tell it. There are flashbacks between 1969 when the body was found and Kya's childhood backstory; and I thought Ms. Owens did a great job with transitioning between the two time periods. In addition, I really liked her character development and how she brought the setting to life. However, it was how she incorporated the nature aspects of the setting (especially the marsh and its wildlife) into Kya's personal story that brought the book to the next level for me. It really make me think about human nature, our instincts, and our behavior. Another fantastic aspect of the novel was the mystery of how Chase died -- was it an accident or was it murder? I don't think I'm ruining anything for you to say that this novel is a bit of a murder mystery and that it does have a few surprising twists and turns. I don't want to give anything away, but I will say that I loved how the novel ended! 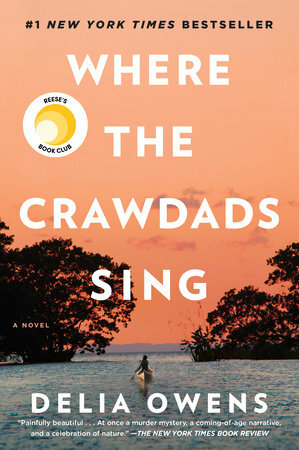 Many book clubs are reading WHERE THE CRAWDADS SING and it's no wonder! This novel is absolutely perfect for discussing, and there's a great reading guide with thirteen interesting questions. Some of the themes you might want to explore are family, loneliness, love, nature, what it means to be a woman, and more! There is also a conversation with the author and some recipes for meaningful food the story. You could throw such a great book club meeting with this kit! I loved WHERE THE CRAWDADS SING and highly recommend it! A member of my book club keeps talking about this book but I've been hesitant to pick it up because I haven't had good luck with the Hello Sunshine picks. You've made me want to read it! This is my next book to read after I finish my current one. Your review, as always, is excellent. So excited to finally experience this book! I keep hearing so many wonderful things about this book. I am on the library hold list for both the ebook and the audiobook and it's going to be awhile I think. I may have to just buy it! The Currently Reading Podcast did an interview with the author which made me want to read it even more!